We are Heidi and Emily. Sisters. Heidi & Emily are both former 2nd grade teachers and current preschool teachers with a combined 17 years experience. We are passionate about making education fun for little ones and teachers alike. We share ideas, tutorials and free downloads here. In our shop you'll find classroom resources like homework, lessons, and workbooks. Read more about us here. This is part 1 in our 3 part busy bag series. Read Part 2 and Part 3. Recently I hosted a busy bag exchange with 20+ of my friends (and their friends). It's an idea that I've seen around the web lately, especially getting inspiration from here and here. I liked the idea that I would work on one project (well two since we hosted two separate swaps) and in return get a variety of activities for my 18 month old daughter. 1. Collect your ideas for everyone to choose from. First I made a pinterest board to gather ideas I found. Then I created a google doc for my friends to sign up. I made a long list of activities with links from around the web that they could choose from, or they could find their own ideas. This was pretty time consuming but so worth it. Because people could check it whenever they wanted it was easy to see the options and switch to a new one that was open if they wanted to. You can see my google doc here and hopefully use it to make your own swap sign up. (I will be highlighting each of the activities that we actually did soon.) It wouldn't hurt to have somebody else co-host this swap with you and help handle the organization and questions. 2. Set guidelines. How many people do you want to include? 20 is a good number, in our experience, when it comes to buying lots of supplies. What are your expectations for the bags? Should they be labeled? Should they include instructions? I found it easiest to share the information in a post on my personal blog. I would be even more explicit if I did this again because there was plenty of confusion and questions. I foolishly assumed that everybody was familiar with the concept of a busy bag swap, which many were not. - Put together the quality kind of bag you would want to receive in return. This is really important to remember! Of course we want to be cheap but we also want the activity to hold up to toddler use. 3. Choose deadlines. First you need a deadline for signups. I would have done this shorter, in hindsight. I kept it open for awhile to give everyone a chance to look over all the activities and invite their friends. The problem with that is that people couldn't work on their bags for awhile because they didn't know how many to make yet. Second you need your deadline for the swap. 4. Encourage the participants to look closely at the costs. Some of the ideas I shared were just that: ideas. But some of the people who signed up thought they had to follow the idea to the letter and therefore spent much more than $1. I would be sure to tell everyone that ideas can and should be adapted to be as low-cost as possible while still being functional. I can tell you from experience that if you do not price out your materials (and shop around with coupons if necessary) it WILL cost you more than you expect. 5. Make an exchange plan. When it came to the actual exchange, things got pretty tricky. You can see in the pictures below that we had a LOT of bags, a LOT of people, and not much room to work. 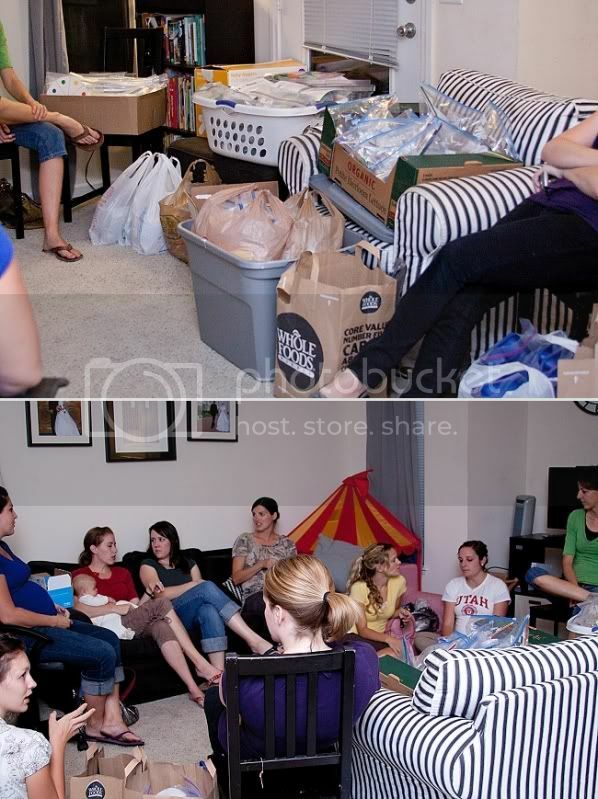 (The pictures only show a portion of the bags and the people there. It was probably 3 times that once everyone was there.) Most people also didn't bring containers big enough to hold everything they were going to take home! What we found to be easiest was for each person to explain what their bag was and show how it worked and then to pass their bags around the circle where each person took one and added it to their pile/box. We had several gals who couldn't come to the exchange so we had to make piles for them which also became tricky since we had to keep track of which bag they brought and not give back that one to them. Printing out my list of who was participating and what they made was very helpful. This also helped us when we went through our own bags to make sure everyone had them all. As I mentioned earlier, we did two separate swaps: toddler and preschool (although we held them on the same evening because most of us participated in both.) You could certainly do one swap with ideas from both age categories but our kids are so varied in ages that I felt like it was better to be more specific. I will be sharing pictures and details about the bags we did and any tips we have for you. So come back soon for that! Want to see the bags from our exchange? Toddler Busy Bags and Preschool Busy Bags. See other busy bags here. 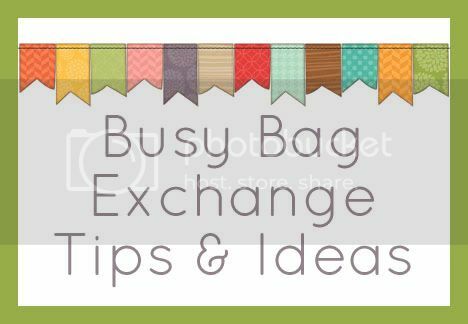 And you can follow my busy bag board on pinterest for even more inspiration! Follow Emily Kate @ Second Story Window's board little busy bags, tot trays, quiet books on Pinterest. The elements I used in the top graphic are from Crystal Wilkerson.